Last Saturday, one of my former professors Jane Woodward hosted a reunion at her gorgeous beach house in Pescadero. Pescadero is a town on the Pacific Coast, just over the Santa Cruz Mountains from Palo Alto. The reunion was to celebrate the anniversary of a class trip to China. Jane and her company MAP were extremely generous and subsidized the cost of a two week educational trip to China for more than 25 students. The trip had an energy focus and we visited the 3 Gorges Dam, a CFL light bulb factory, a coal plant, a solar PV plant, a wind farm - to name just a few of the sites we saw. Over the two weeks we visited 6 cities all across China and it was an incredible experience. I took these photos at Jane's beach house last Saturday. According to John TH (aka the weatherman), Pescadero is usually socked in with clouds at this time of year. As you can see - it was absolutely gorgeous. At only ~50 minutes from the Palo Alto area, it is an escape that is close enough to feel convenient, and far enough to feel remote - the perfect combination. Thanks again to Jane for hosting us! I had a wonderful time. Last Christmas, my fiance got the William Sonoma Vegetable Chop and Measure from his mom. I must tell you, that we have used this thing almost every day for the last 4 months. It is amazing. When I used to make red beans and rice, chopping the celery, onion, green onion, and green pepper took 30 or so minutes. Now, it takes about 5 and the chop is perfect. It is sort of strange to see such a hearty, homey dish like red beans and rice come out with perfectly chopped veggies. Last night I was raving about our chopper to Julie and Julia, and I realized that I should spread the love even wider and post a photo on my blog. So here is my secret, my favorite kitchen tool - the WS chop and measure. Happy cooking! Yesterday at lunch, I attended the Volunteer Recognition Luncheon put on by the Junior League of San Jose. It was an event to recognize outstanding volunteers serving San Jose and the greater Bay Area. It was a deeply moving and incredibly inspirational event. While all the award recipients were dedicated, committed, and deserving... one of the 10 winners stood out among the rest - my fiance's mom, Barbara Mount. Mrs. Mount received the Voluntarism At Its Best Award for her work with the JW House. Here is the video that describes her work (I am assuming that the Junior League will eventually post this video on their website, but until then... a video of a video will have to do). The story of JW and Mrs. Mount is truly inspirational. JW was a student at Bellarmine high school, where Mrs. Mount worked with the choir - meeting JW when he asked to join the choir to play the bongos. Then, as a freshman, JW was diagnosed with brain cancer. During his battle with cancer, he came up with the idea of creating a "home away from home" for other children and families receiving treatment who needed a place close to the hospital to stay. Mrs. Mount took this idea and made it a reality - a truly remarkable feat. To read more about JW, or to make a donation, visit www.jwhouse.org. As Mrs. Mount said in her acceptance speech - JW was truly a man for others. 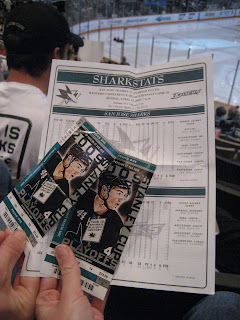 Last night we went to the Old Pro in Palo Alto to watch playoff hockey and to celebrate Eli's birthday. Above you can see a shot of Eli's birthday cake - flaming candle and all. 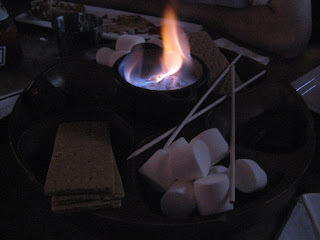 Of course, we did also ask the waitress to bring a shot that went with smores - and she obliged with a chocolate cake shot, which Eli downed for the occasion (pictures which I won't post here). Happy 31st birthday Eli! 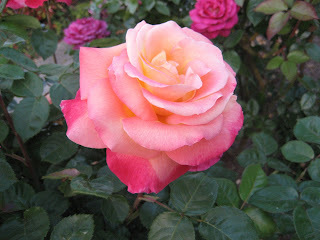 Wednesday night when I got home from work, I noticed that the 'hot cocoa' rose purchased by my fiance's mom had bloomed! What a beautiful soft shade of red. These blossoms represent the first outdoor plant that I have managed to keep alive (or healthy) long enough to flower! 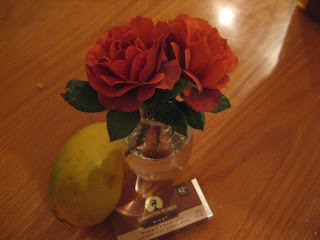 We brought the blooms inside and I took their photo with a nibby bar and the champagne mango I ate for dessert while watching my brother's girlfriend on America's Next Top Model (new episodes at 8pm on Wednesdays). Thanks again to Mrs. M for the rose bush! I thought I would share a quote, a note, and a photo that I got from my mom - to show appreciation not just for my mother Earth, but also for my earthly mother. Above is a quote from her favorite author, sent in honor of Earth day. 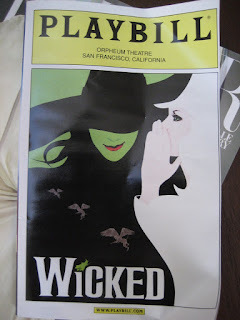 Last week my fiance and I went to see Wicked in San Francisco. It was so much fun! We had gotten the tickets for a discount through my work months ago, so I had almost forgotten how excited I was to see this musical! Not only was the music wonderful, but the sets and costumes were fantastic. They were playful and unusual - like nothing I had ever seen. We went home and downloaded some of the songs so we could remember some of our favorite parts. Last night I decided to use my leftover Thomas Keller chicken to make one of my favorite recipes from the Better Homes and Gardens red plaid cookbook. It is called Turkey and Phyllo pie. I don't really like phyllo in this pie (I made it once and it tasted greasy) so I use my mom's pie crust recipe and treat it like a pot pie. I also used chicken in this case because I had it on hand from the night before. 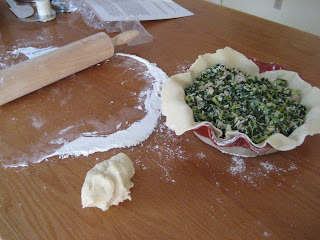 For fun, I always roll out a little extra dough and make shapes. Since Wednesday night is date night, I thought that hearts would be appropriate. 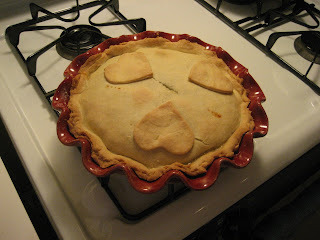 Here is how the pie turned out after 50 minutes in the oven. 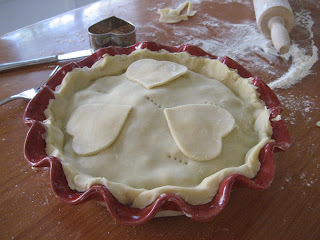 My red ruffle pie dish is looking so good! It was a present from Zizi and James last Christmas and I LOVE it. The inside of the pie is quiche like because there is some egg and cheese in the filling. 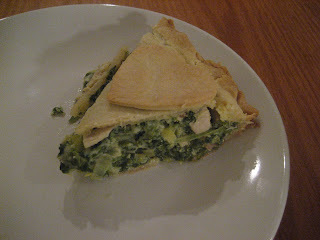 The ingredients include leeks, garlic, spinach, milk, eggs, mozzarella cheese, and parmesan cheese. It was delicious! About a year and a half ago, my coworker Kevin introduced me to the magic that is Thomas Keller's favorite chicken recipe. Thomas Keller is the chef of the French Laundry fame and this recipe is what he says that he makes for his family - simple, yet delicious. The first meal that I ever cooked for Dave was this salty, crusty delicious chicken, mashed potatoes, and honeyed carrots. Tonight I surprised him by making it again. It was just as delicious as I remembered. Every Easter when I was growing up, my mom made a cake shaped like a lamb. This year, as I was preparing to celebrate Easter with my fiance's family - I thought that it would be really cool to carry on this tradition with them. I was especially excited because my sister was visiting from New York and my brother was going to come down from SF with his girlfriend to help prepare the cakes. I bought two lamb cake molds - mostly because I didn't know which one would look better - and I thought it would be fun to make two of them with the 5 of us. The above shot shows the two molds. For the smaller cake, we decided to channel the movie "Steel Magnolias" and make a surprise red velvet lamb - that would look like a real lamb when it was cut into. This is definitely not part of the original family tradition, but Bridget and Dave were excited about making something playful. Here is the red velvet cake as it is hidden under cream cheese frosting. After the icing was slathered on and the shredded coconut was applied - the smaller cake did indeed look like a lamb. However, the larger cake looked like a fluffy white lap dog. The reveal! As Bridget cut off the head, there was a collective gasp! It was really funny. Here are the two cakes halfway eaten! A success! By next year, hopefully they will look more like lambs and less like dogs. Happy Easter! I will update with more pictures from our Easter celebration in Northern Cali soon. In the meantime, check out my sweet niece Cecilia finding Easter eggs in my backyard in New Orleans. Last weekend I went to the Palo Alto farmer's market with Julie and Julia and left with these gorgeous flowers. The top picture shows a bunch of ranunculus flowers and the bottom photo is of cherry blossom branches. The cherry blossom branches are very interesting because over the last week, they have sprouted leaves! I wonder if they realize that they are no longer attached to a tree. I love flowers to begin with, but with a wedding coming up, I am paying a lot more attention! I tend to love big floaty, flaky blossoms like peonys, antique roses, rinoculous, etc. Today was a co-worker's last day. He is taking off to South America with his fiance for a year and then returning to go to grad school. Best of luck!